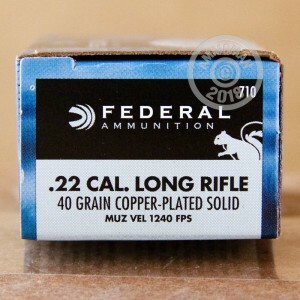 Federal 710 copper-plated round nose (CPRN) .22 LR ammo is a wonderful choice for small game hunters who are concerned with preserving skins and hides in the best possible condition. These solids are designed to pass through rather than expand while still delivering a formula-proven amount of energy and shock to the game animal. At 40 grains, this projectile profile matches that of numerous other loads and comes equipped with a segmented bourrelet which makes greater contact with rifling surface area during barrel travel. As a result, these rounds exhibit consistent ballistics and notable accuracy. 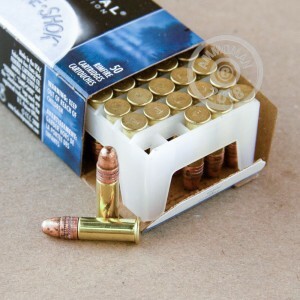 Each bullet is fitted to a rimfire brass casing which has a clean-igniting primer mixture at its foundation. Federal manufactures this ammo in Minnesota and maintains strict quality control by way of in-house components and multipoint inspections. 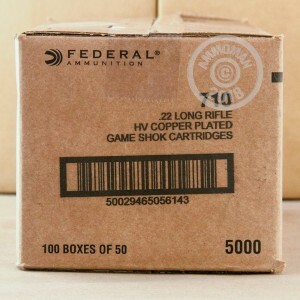 Federal Premium is recognized around the country as a dependable source of ammunition for any occasion. The Game-Shok line comes packaged in eye-catching blue boxes and is as affordable as it is effective.